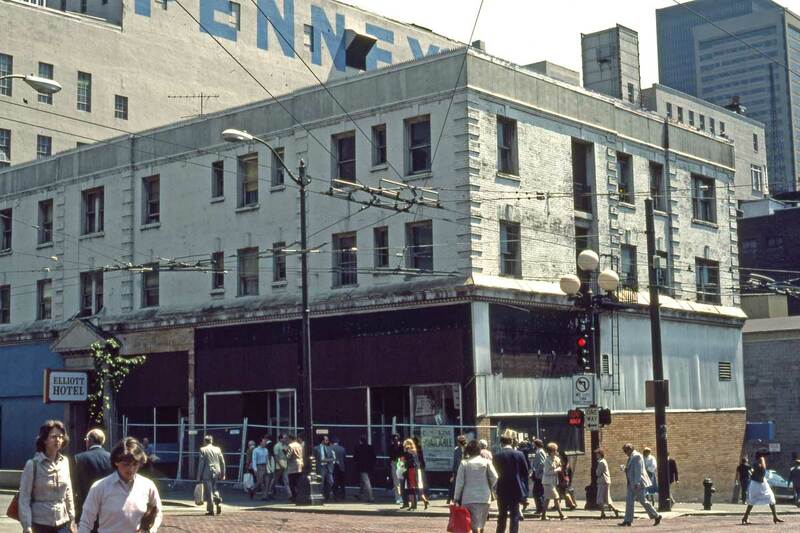 NOW: With the sidewalks on Pike Street widened in the early 1980s, Jean Sherrard could cross the old curb line for a more revealing angle on the surviving structures on the north side of Pike between First and Second Avenues. 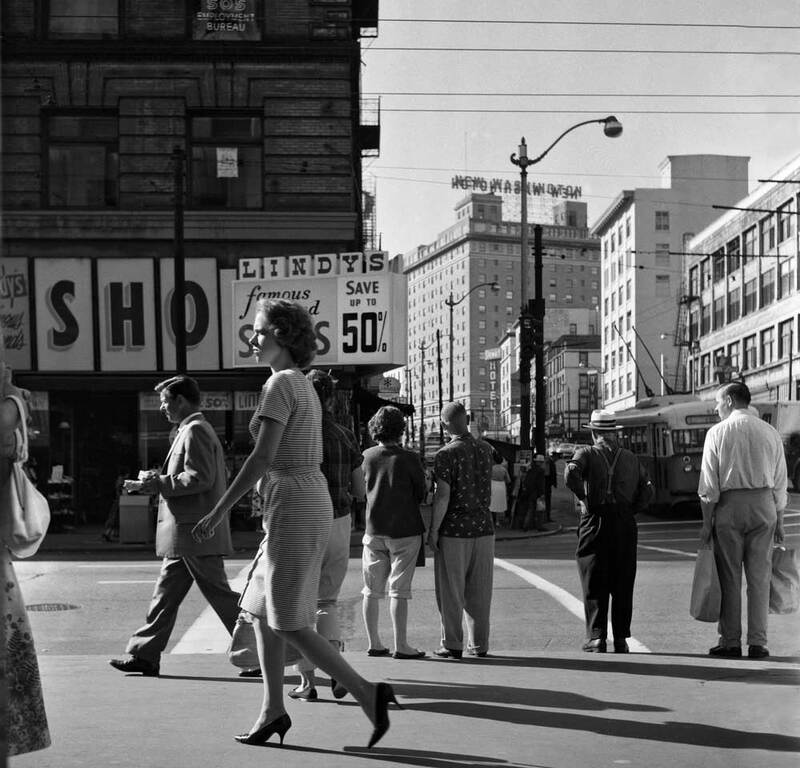 Here an autumnal sun brightens the endearing clutter of Pike Street, on Friday Nov. 6, 1953. The date has been hand-printed on the negative, bottom-right, and the time – approaching 2:25pm – is marked on Dr. James Sender’s street clock standing tall above the old sidewalk. By 1953 Sender, a past president of the Northwest College of Optometry, had been fitting glasses in this neighborhood for more than twenty years, although at 108 Pike he is here nearly brand new. Sender shared the address with the Mirror Tavern, where some customers surely found their future reflected in a glass of beer. You will find a large part of the bar’s mirror-shaped sign hanging above the sidewalk directly behind Sender’s clock. A small advertisement from Nov. 3, 1953 for what it says. How can he do it for $6.50 – even in ’53? 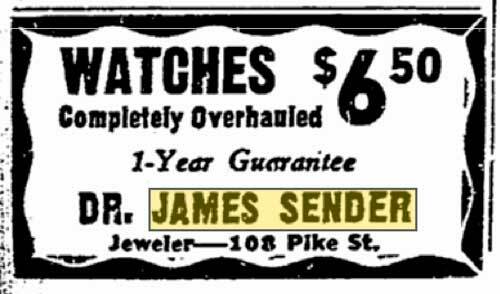 Judging from the optometrist’s advertisements, with this move, Sender began turning his attention increasingly from eye care to selling jewelry and fixing time-pieces, including his big one out front. It was once nearly obligatory for jewelers in the business district to have a clock on the sidewalk, and to also care for it. 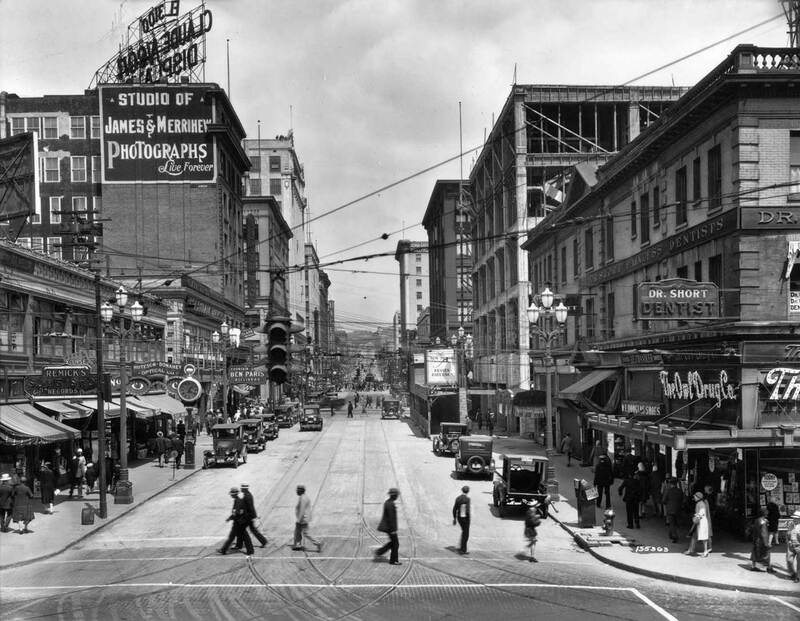 From the late 1920s – we presume – we see that a sidewalk clock is already in front of Sender’s Pike Street address years before me moved there. But is it the same clock or the foundation for a Sender variation? 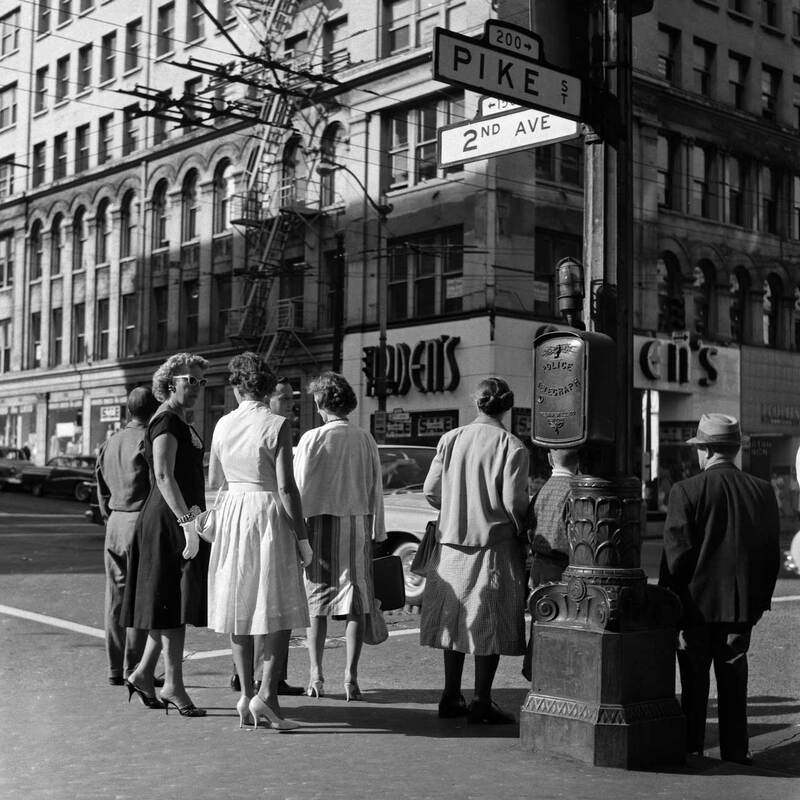 I have learned from Anne Frantilla, Seattle’s Assistant Municipal Archivist, that the “purpose” of this public works recording was not to compose an engaging tableau of Pike Street culture, mid-20th Century – which it yet is – but rather to spy on Sender’s clock and with other snaps other big clocks in the business district. 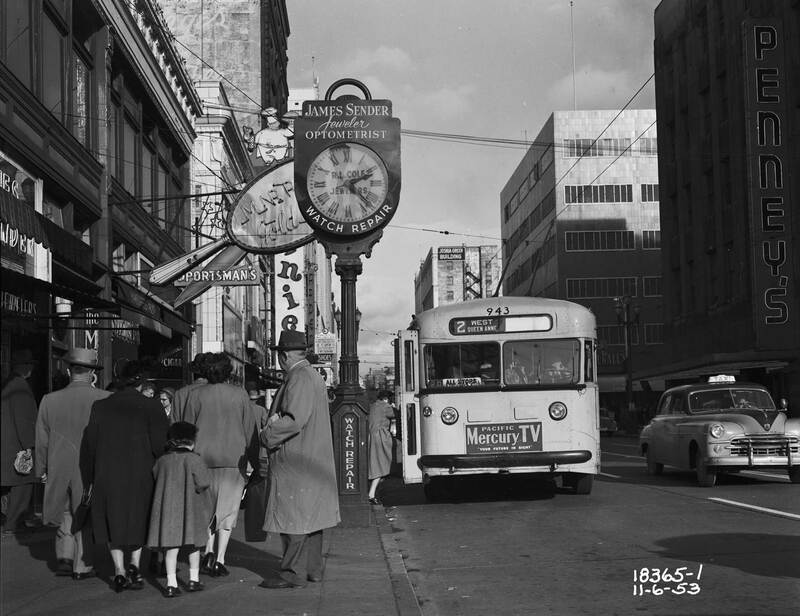 In 1953 a piqued Seattle city council was preparing to get rid of street clocks altogether. Too often, they chimed, these landmarks knocked pedestrians’ knees while keeping poor time. They did not succeed. In 1980 a different city council declared the then ten surviving street clocks historical landmarks. The Seattle Times clip from Oct. 22, 1953 describing the resolve of some city council members to removed street clocks – for reasons described. Archivist Frantilla also directed me to Rob Ketcherside, a Seattle historian with an enduring interest in Seattle’s street clocks. 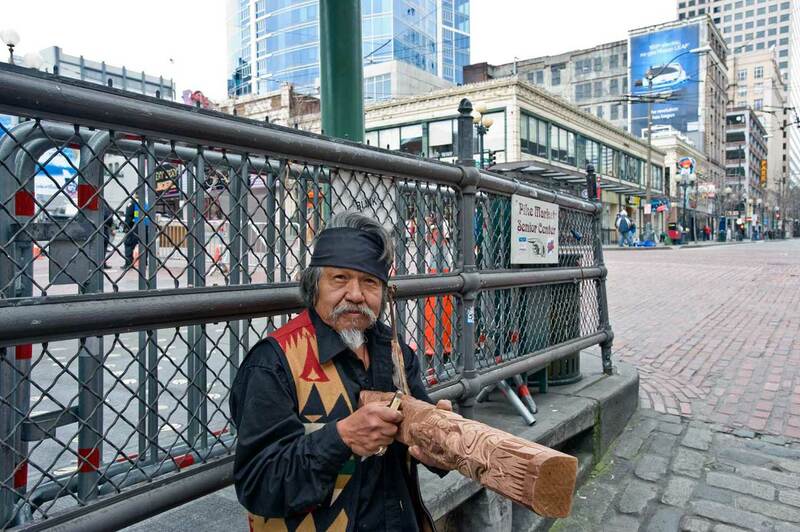 (We featured Rob in Pacific on Nov. 1, 2009 for a “now & then” subject on Green Lake history.) Ketcherside’s own “clock works” can be found on his website. 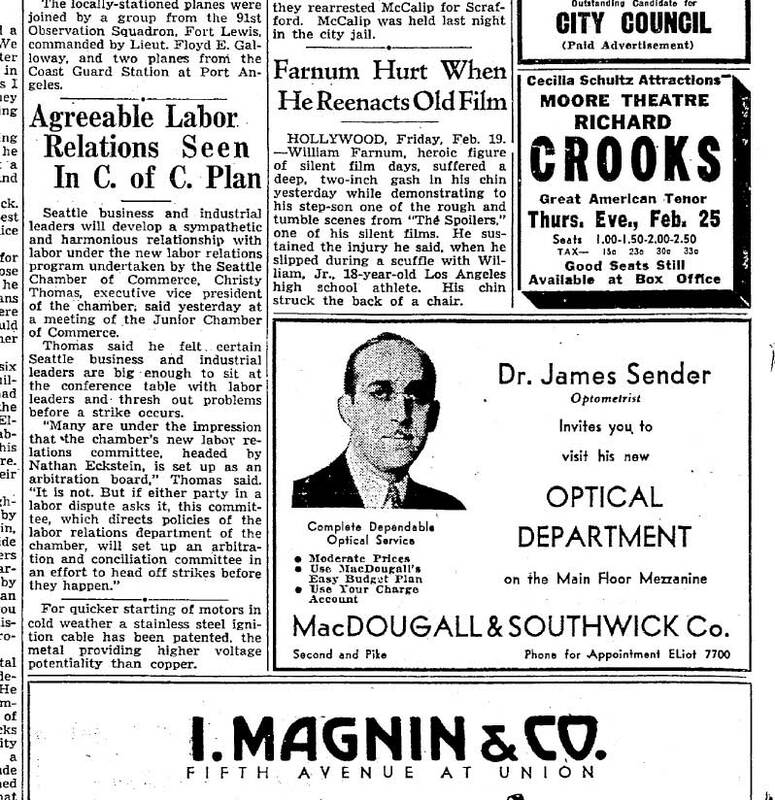 An adver from Feb. 19, 1937 noting James Sender’s new alliance with the MacDougall and Southwick Department store, which was then at the southeast corner of Second and Pike, the last location of a venerable retailer that began in 1870s on Commercial Street (First Ave. S.) as the San Francisco Store. Certainly Jean. 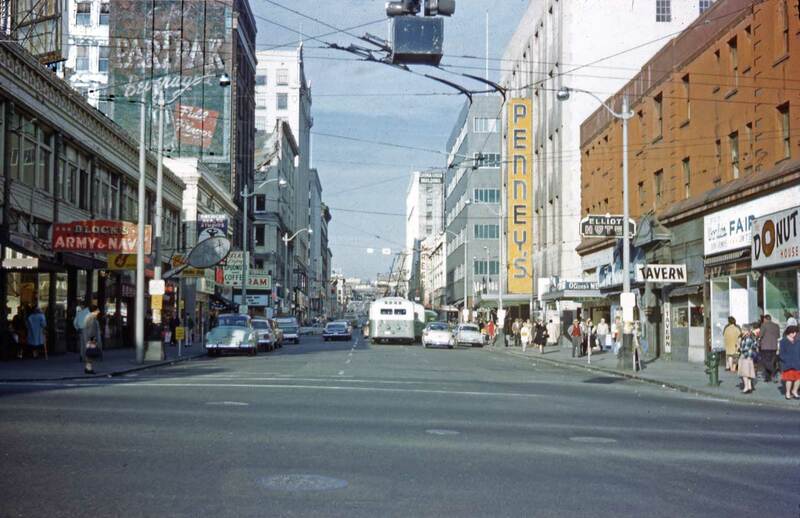 We will start with two color slides by Lawton Gowey that look into this same block in 1963 and 1976 followed by five other features all of which are on subjects within a few feet the one above. 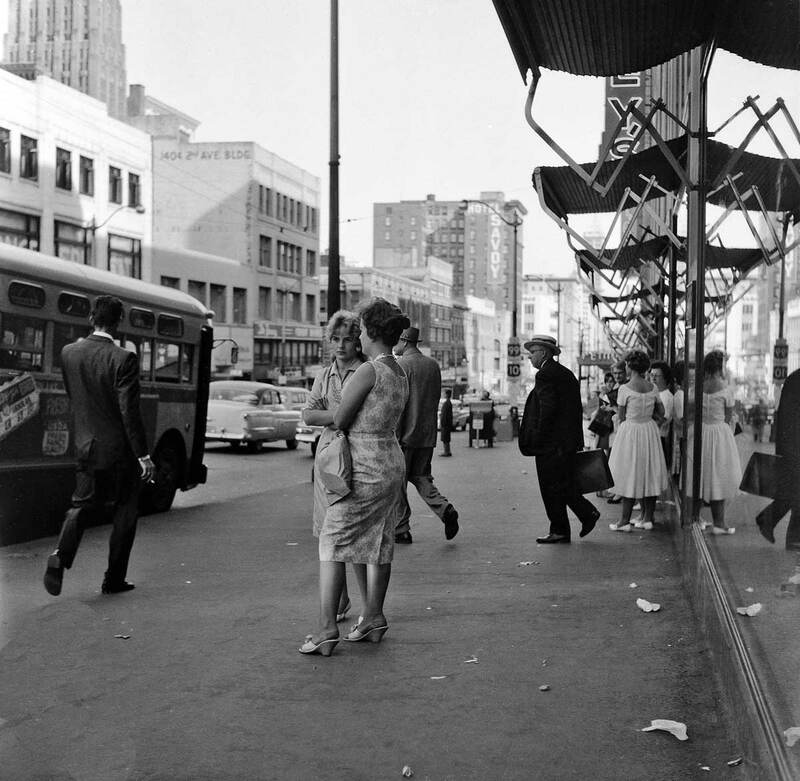 Looking west on Pike from the Public Market on April 2, 1963. The slide is by Lawton Gowey. 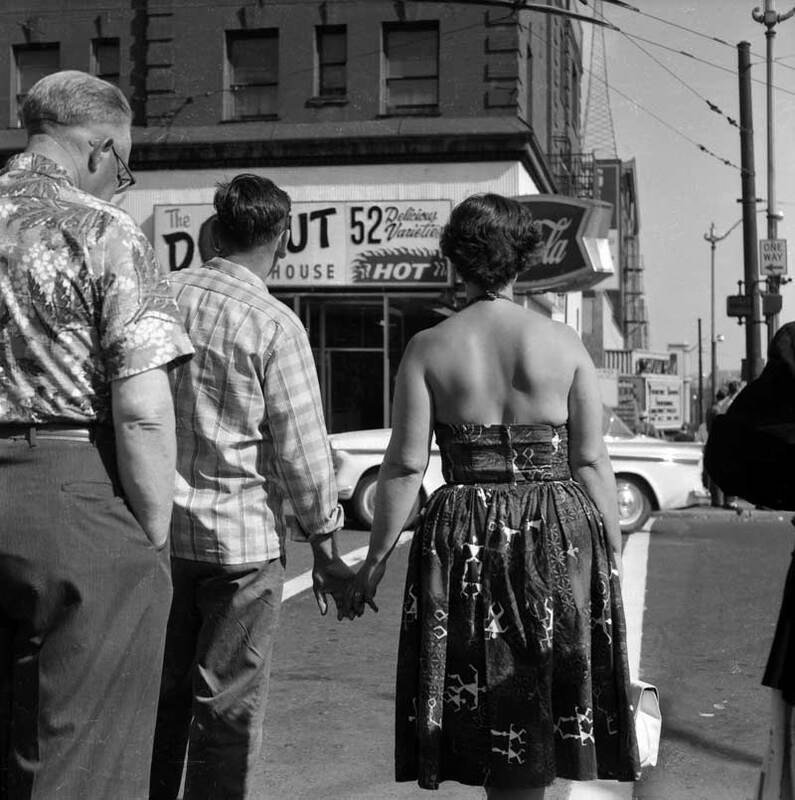 Not the once-upon-a-time notorious donut shop on the far right. The mirror tavern is still in place, and so is the MacDougall and Southwick Department store in its aluminum skin, right-of-center, at the southeast corner of Second and Pike. Three years more and the store would announce on Feb. 6, 1966 its closure. A Seattle Times clipping from Jan. 14, 1966, with Time’s real-estate editor, Alice Staples, revealing the big department store’s intentions to quit. The Donut House seen in its own hole between shoulders, ca. 1962. April 21, 1976 looking east from the market. Pennys has a new corner sign and the aluminum beyond it is gone, replaced by a parking lot. Both sides of Pike in this block are appointed with nearly down-and-out retailers, including the donuts. The Mirror Tavern, once Dr. Sender’s neighbor, is still reflecting. 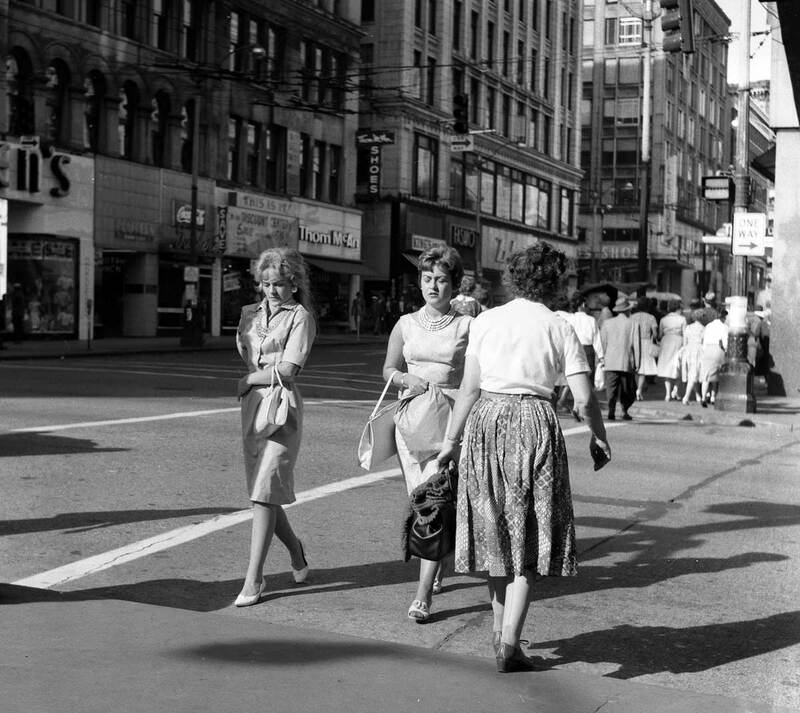 FIVE FROM BEFORE (We’ve shown these Victor Lygdman shots at 2nd and Pike circa 1962 before but we include them again here – as Jean’s reminds – for “reference.” For all Five Victor is standing at the southwest corner of Pike and Second. 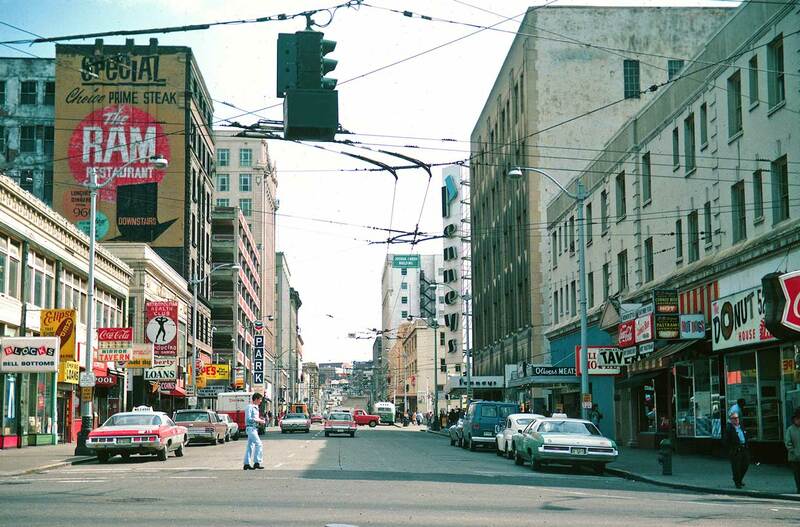 LOOKING north on 2nd across Pike with a sale sign up on the old Eitel Building, at the northwest corner of Pike and 2nd, on the left. Across Pike and up Second as well, but with the Eitel now off frame to the left. Looking now east on Pike with the extreme corner of MacDougall and Southwick – and part of its aluminum skin – upper-right. Lygdman’s photos just shown are of an intersection still not “inflicted” with parking lots or garages at its northeast and southeast corners. 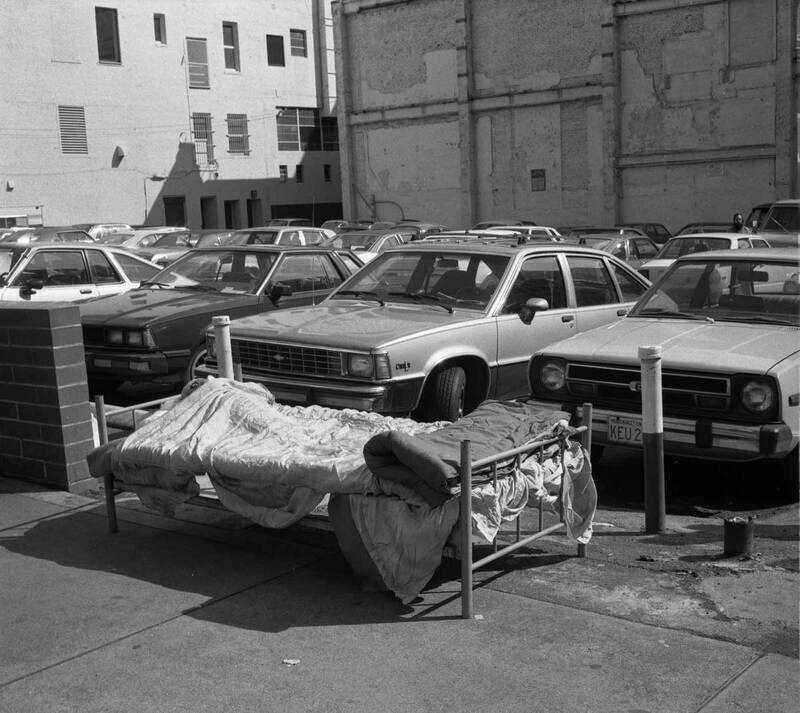 Victor Lygdman returned to the intersection a few years later for this study of the parking lot that had been the MacDougall and Southwick Department Store, recording perhaps a leftover from the big store’s home furnishings. 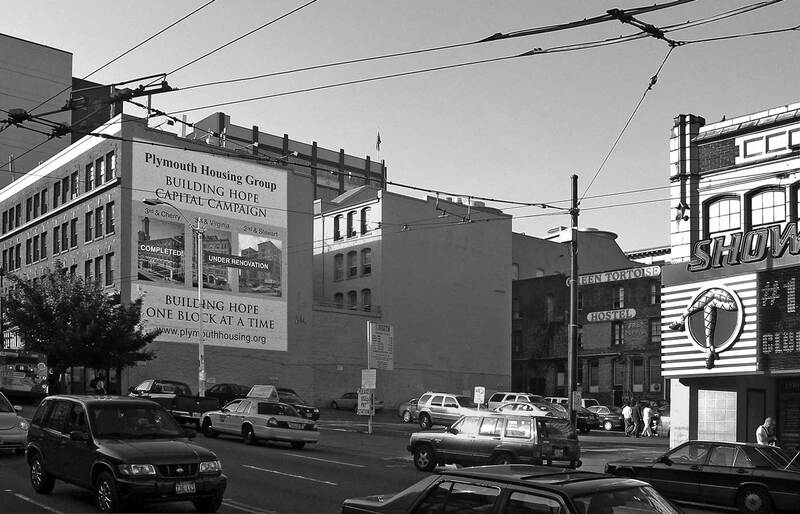 Lygdman back at the southwest corner of 2nd and Pike, circa 1962, here looking south on Second. Above and Below: More than a century separates these two looks east up Pike and across First Avenue. 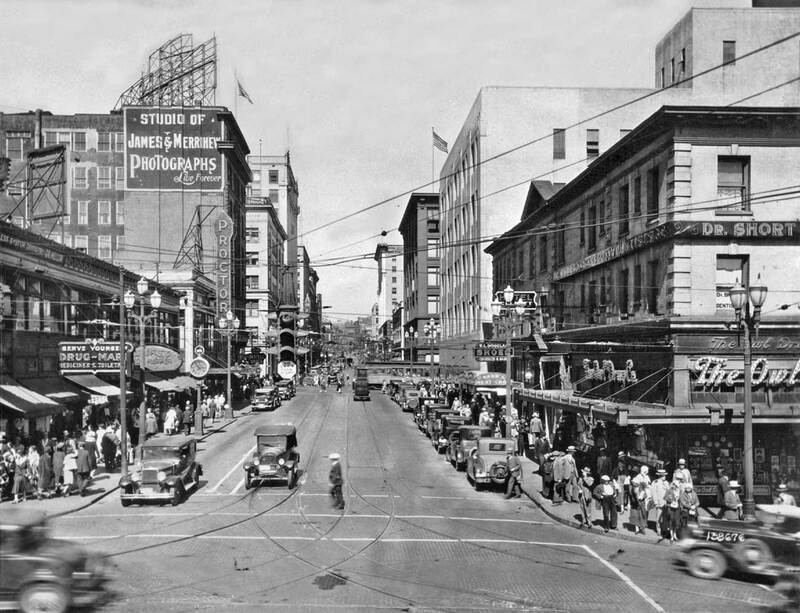 In the first block before Second Avenue among the shops on the left of the “then” are a tobacconist, a beer hall, a tailor, and two restaurants, the Boston Kitchen and the Junction Restaurant. On a sidewalk sign the latter offers “Mocha Java Coffee.” How hip! 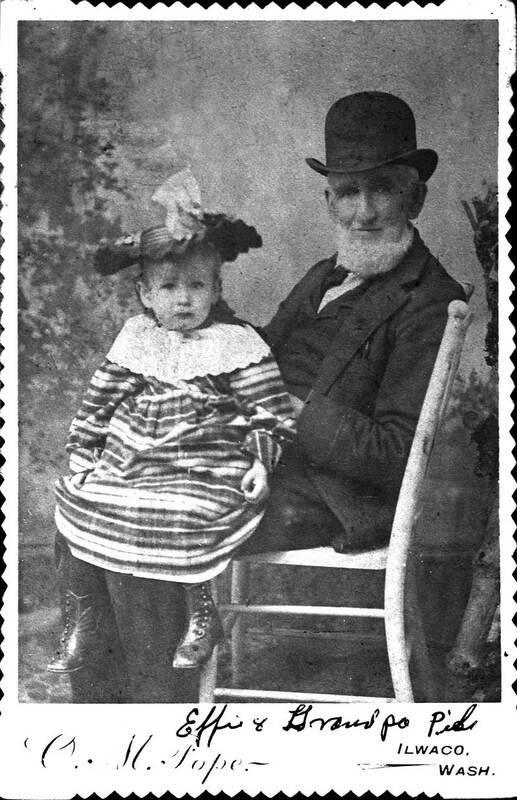 Historical photo courtesy Lawton Gowey. This one Lawton collected. 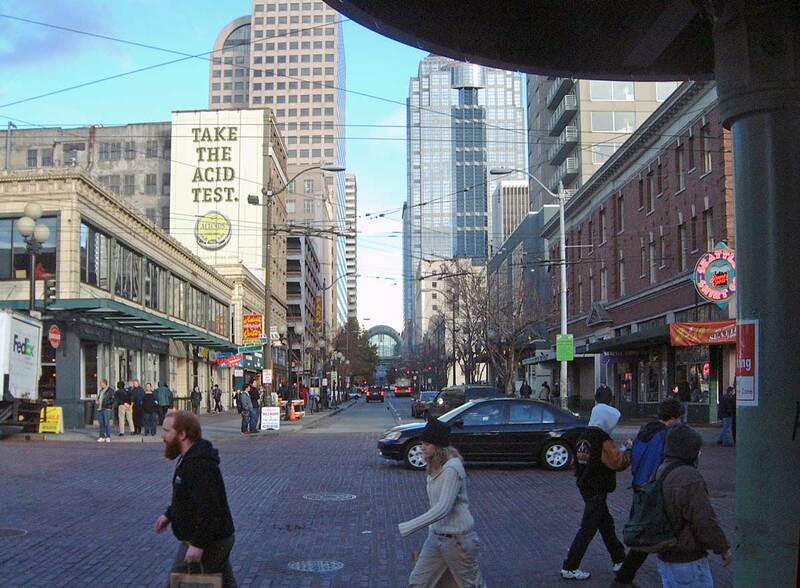 A “repeat” from Nov. 24, 2003 looking east on a Pike with wider sidewalks, planters and retro light standards, and also with its consummating arch at 7th Ave. a gateway to heaven and/or Capitol Hill. An earlier “now” from April Fools Day, 1992. 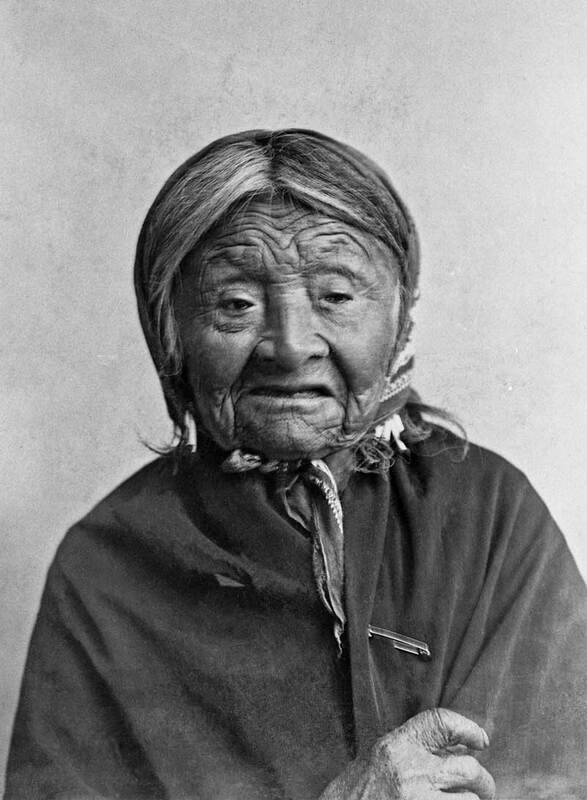 The oldest recorded remembrance of Pike Street describes it as a blazed trail twisting between high stumps sided by violets, trilliums and wild currants, ending in a dense forest at about Eighth Avenue. Here, about 30 years later, is Pike at the tum of the century, in transition from its pioneer status as the community’s northern boundary to the retail district’s principal commercial strip. 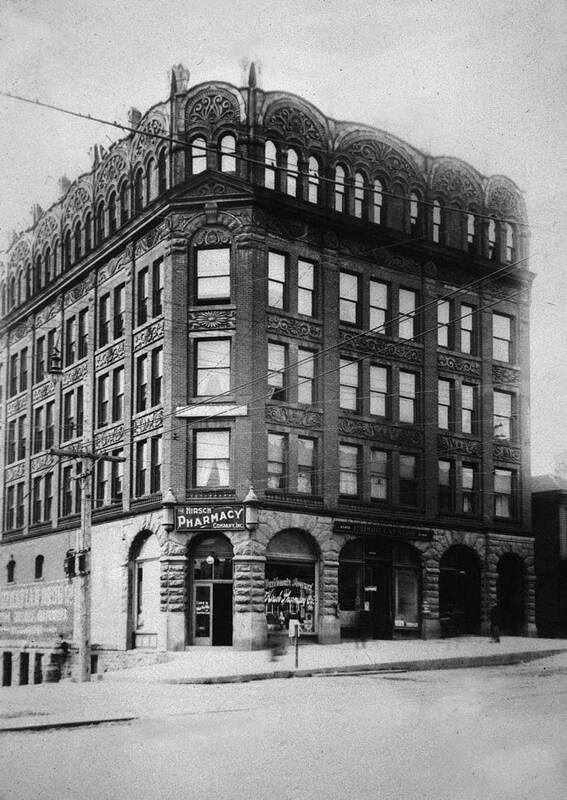 The bricks are in place – laid in 1895 – but a few of the pioneer frame business houses still shoulder the street. Two different sets of streetcar tracks appear here. On the right the rails of the Front Street (First Avenue) Cable Railway tum up Pike from First. The slot for the cable, which is evident between the tracks, was removed in 1901 when this line was switched to electric power. The tracks on the left were laid for electric cars from their beginning in 1889. They follow the route of the old horse cars to Belltown originally laid here in 1884. 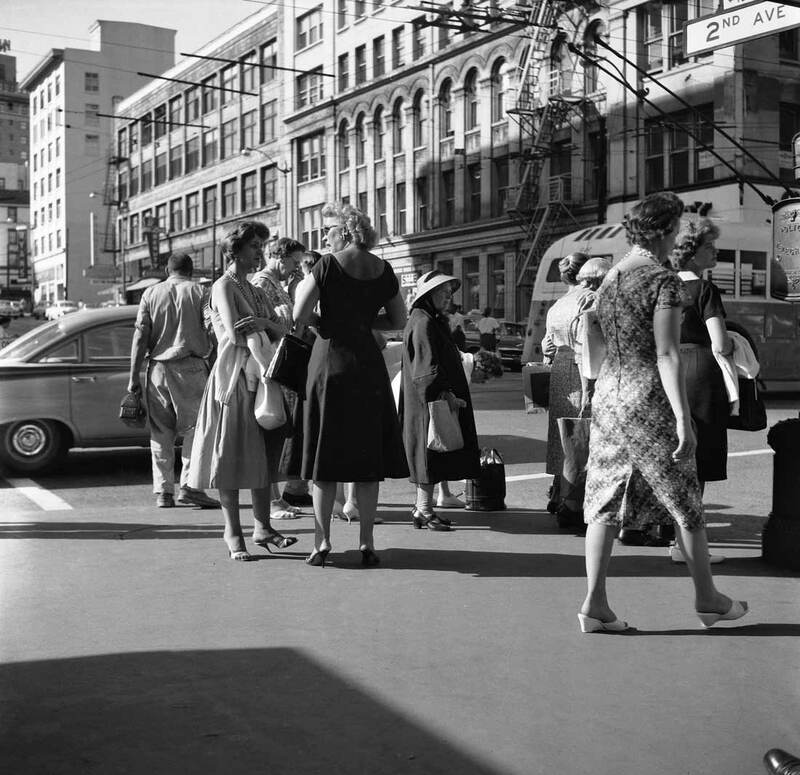 Standing at the entrance to the public market in the crosswalk on the west side of First Avenue and looking east up the centerline of Pike Street – like in this week’s “now” – you may imagine trains rolling directly through you and also under you. And while you may no longer see them they can still be felt. The once popular Seattle historian-journalist J. Willis Sayre explains why in “This City of Ours” his entertaining book of Seattle trivia that was published for Seattle Schools in 1936. Part of Pike Street in 1878 near Second Ave. detailed from Peterson’s panorama of Seattle taken that year from a Denny Hill prospect. Note the coal road railroads tracks on Pike. They have been abandoned for the new coal railroad around the south end of Lake Washington to the the new coal bunkers off King Street. A remnant of the coal roads trestle – left-of-center – that lowered the coal cars along Pike Street to the long coal wharf off shore. 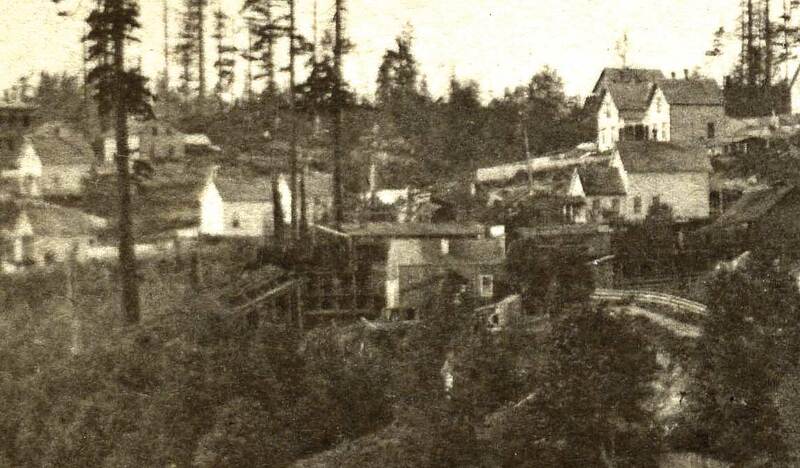 This too is from an 1878 Peterson panorama – this one taken from the end of Yesler’s Wharf. Describing a tour on First Avenue Sayers writes, “Now lets go down to Pike Street. Here you are directly above the Great Northern tunnel built under the city in 1904.” Today, if you are sensitive and wear wooden shoes (preferably) you can still feel the rumble below. However, the choo-choo-coming-at-you through most of the 1870s was Seattle’s first railroad, the narrow gauged train that carried coal cars transferred from scows on Lake Union to bunkers at the waterfront foot of Pike Street. Again, it was not passing beneath Pike but along it – between what would become Westlake in 1906 and the coal wharf. 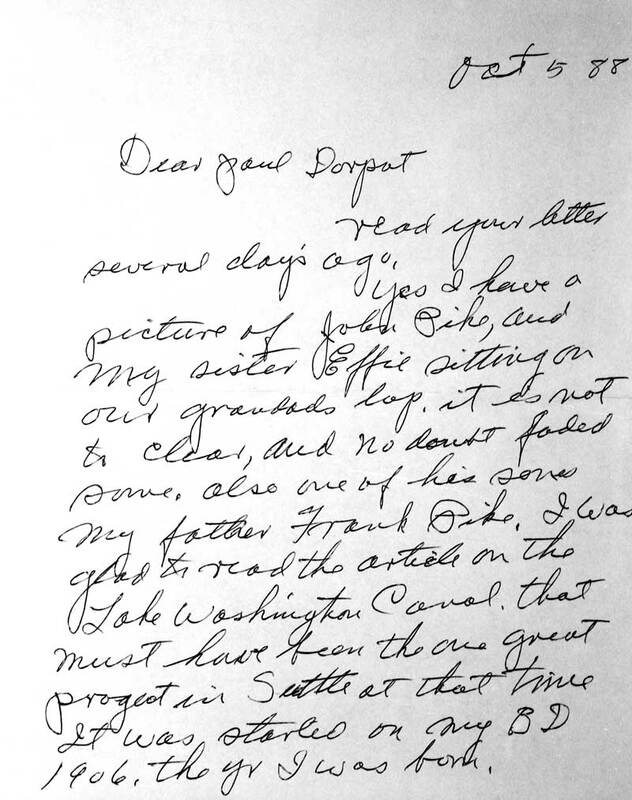 In “Pig-Tail Days in Old Seattle,” our oft-quoted 1930’s classic of local history, pioneer Sophie Frye Bass, David and Louisa Denny’s granddaughter, recalls jumping upon the coal cars as they rumble along Pike in the ’70s. The Bass family home was on Pike. When I find page two to this missive we will discover who originally sent it to me a quarter century ago. 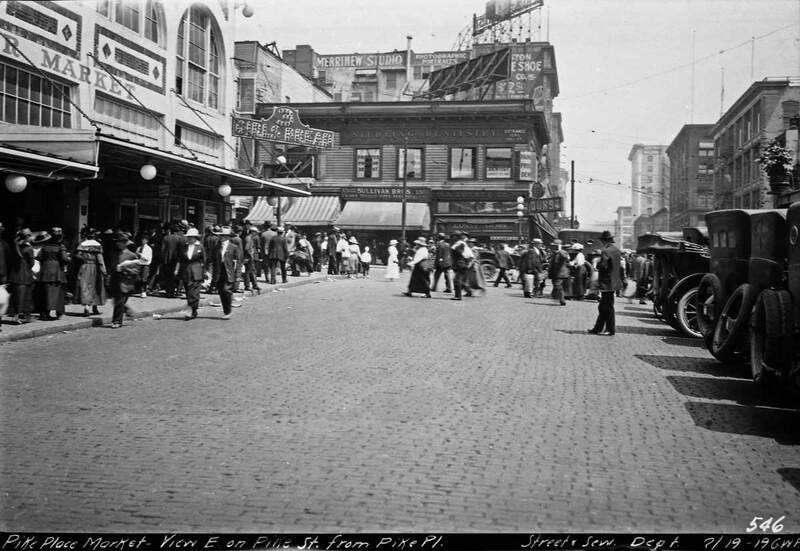 The historical view east on Pike was recorded a few years before the tunnel was built beneath it – sometime between 1897 and 1900. One block away the trolley turning west off of Second Avenue onto Pike carries a roof banner advertising the sale of Gold Rush outfits at Cooper and Levi’s in Pioneer Square. That national fever began in ’97, and in 1901 – we repeat – the rails for the Front Street (First Ave.) Cable Cars were removed. Here on the right they still take a right turn to Pike from First Avenue. 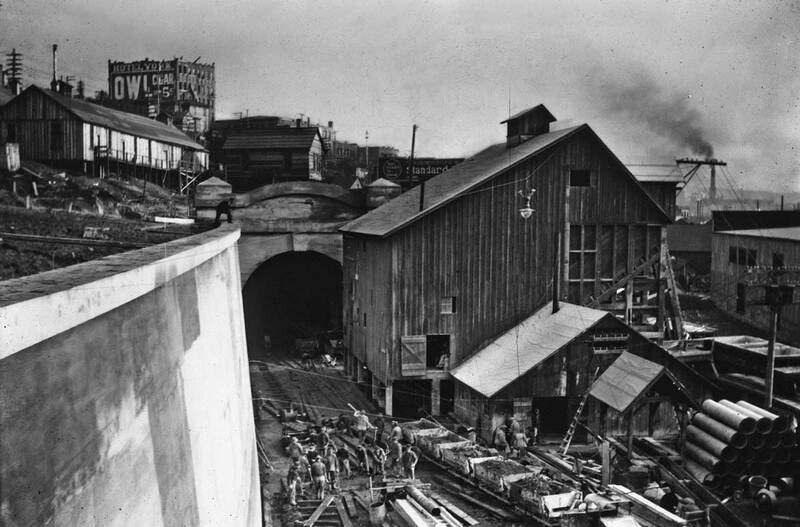 The northern portal to the tunnel with the waterfront hidden on the right and the Hotel York on the right horizon at the northwest corner of First Ave. and Pike Street. The hotel was doomed by the tunneling and razed soon after the tunnel passed below it. Today – for a wile more – the Alaskan Way Viaduct crosses above this portal near Virginia Street. The subject dates from 1904 during the tunnel’s construction. Hotel York at the northwest corner of Pike and First before its foundation was compromised by construction on the railroad tunnel in 1904. When the tunnel was being built the public works department made it’s by now oft-sited traffic count on Pike St. at Second Avenue. Of the 3,959 vehicles that used that intersection at Pike on Friday Dec. 23, 1904 more than three thirds were one or two horse express wagons. The buggy count reached 178, but only 14 were automobiles had used the intersection. 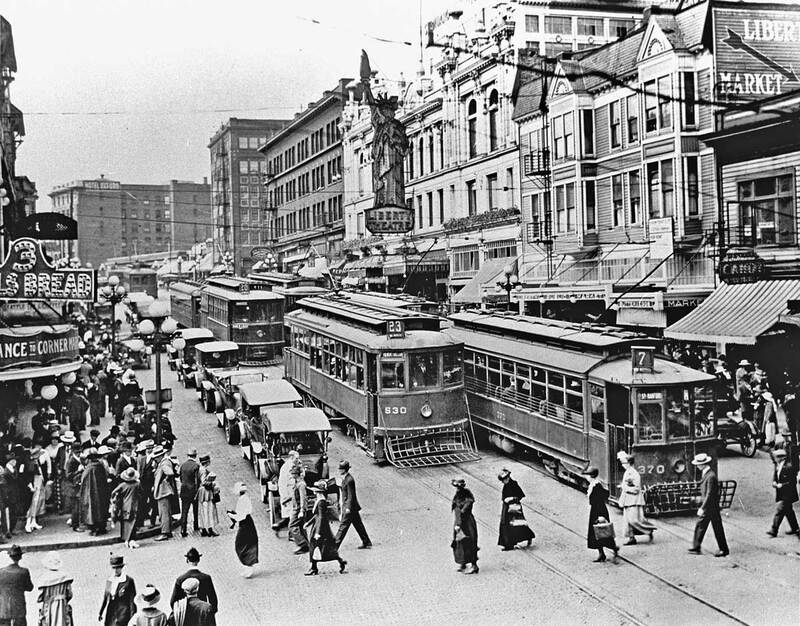 Walking and public transportation – trolleys – were the way to get around. 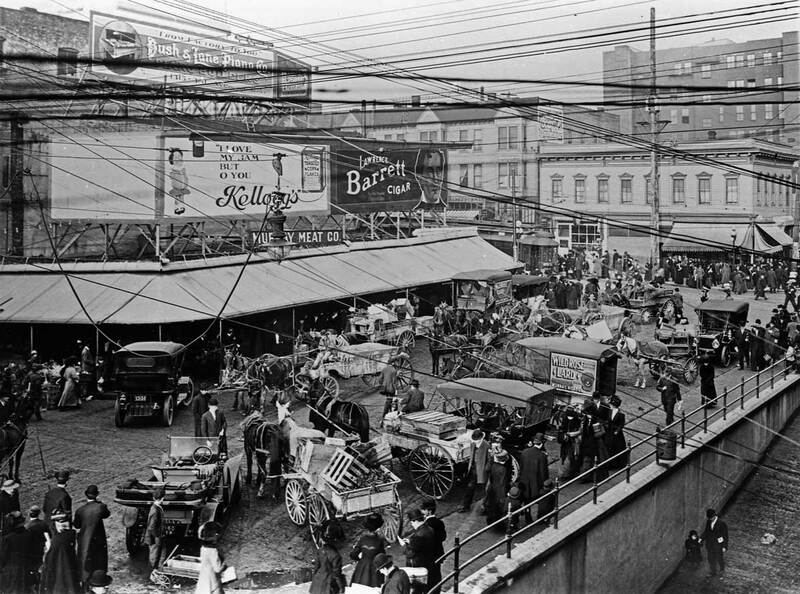 Then and Now Captions together: The Pike Place Market started out in the summer of 1907 as a city-supported place where farmers could sell their produce directly to homemakers. Since then the Market culture has developed many more attractions including crafts, performers, restaurants, and the human delights that are only delivered by milling and moving crowds. 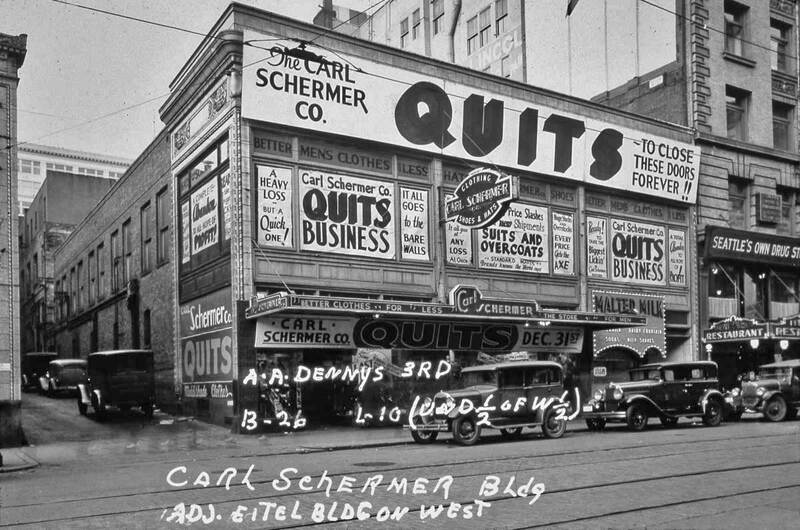 Historic photo courtesy Old Seattle Paperworks, Pike Place Market. 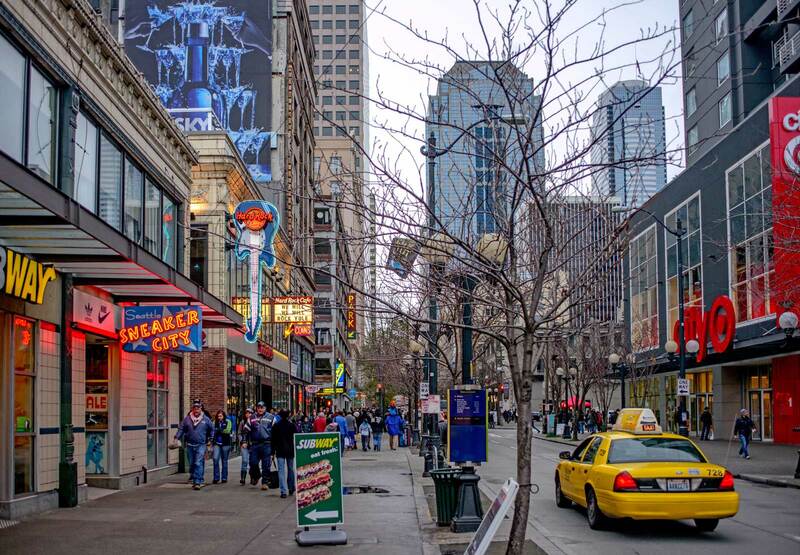 A century ago Seattle, although barely over fifty, was already a metropolis with a population surging towards 200,000. Consequently, now our community’s centennials are multiplying. 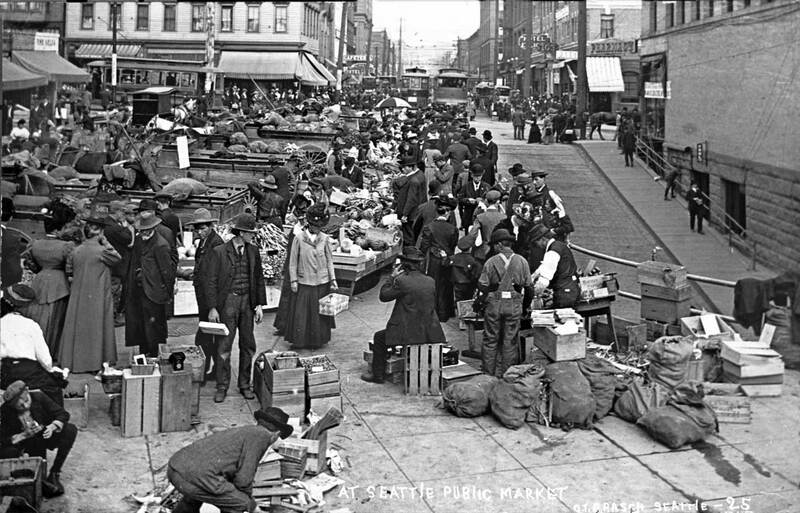 This view of boxes, sacks and rows of wagons and customers is offered as an early marker for the coming100th birthday of one of Seattle’s greatest institutions, the Pike Place Public Market. Both the “then” and “now” look east from the inside angle of this L-shaped landmark. 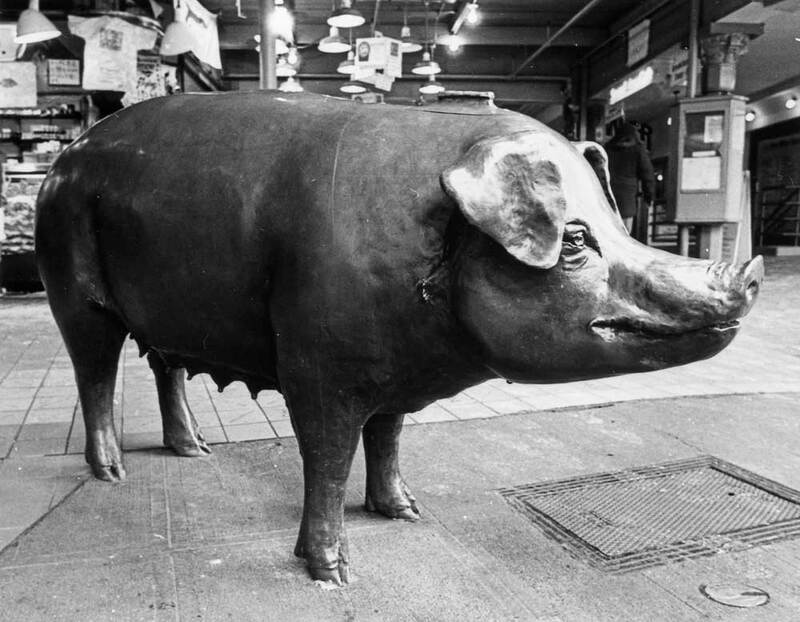 The contemporary view also looks over the rump of Rachel, (bottom-left) the Market’s famous brass piggy bank, which when empty is 200 pounds lighter than her namesake 750 pound Rachel, the 1985 winner of the Island County Fair. Since she was introduced to the Market in 1986 Rachel has contributed about $8,000 a year to its supporting Market Foundation. Most of this largess has been dropped through the slot in her back as small coins. It has amounted to heavy heaps of them. In 1962 and near the future home of Rachel the charitable pig. Victor Lygdman shot this. Next year – the Centennial Year 2007 – the Market Foundation, and the Friends of the Market, and many other vital players in the closely-packed universe that is the Market will be helping and coaxing us to celebrate what local architect Fred Bassetti famously describe in the mid-1960s as “An honest place in a phony time.” And while it may be argued that the times have gotten even phonier the market has held onto much of its candor. The historical view may well date from the Market’s first year, 1907. If not, then the postcard photographer Otto Frasch recorded it soon after. 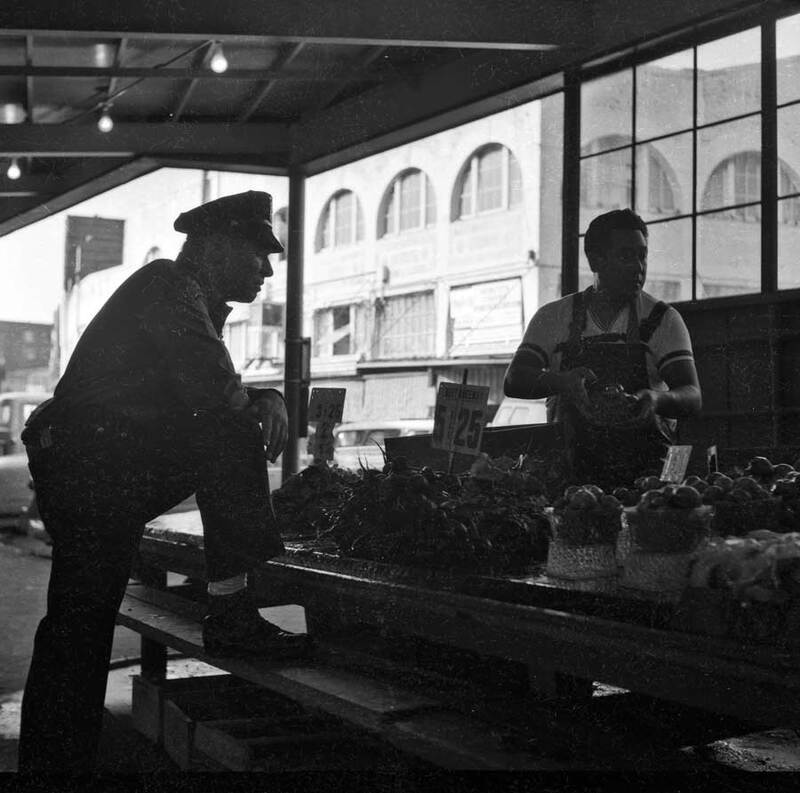 It is a scene revealing the original purpose of the Public Market: “farmers and families” meeting directly and with no “middleman” between them. The subject directly below also looks east on Pike from its elbow into Pike Place. It is dated July 19, 1919 – and captioned too. 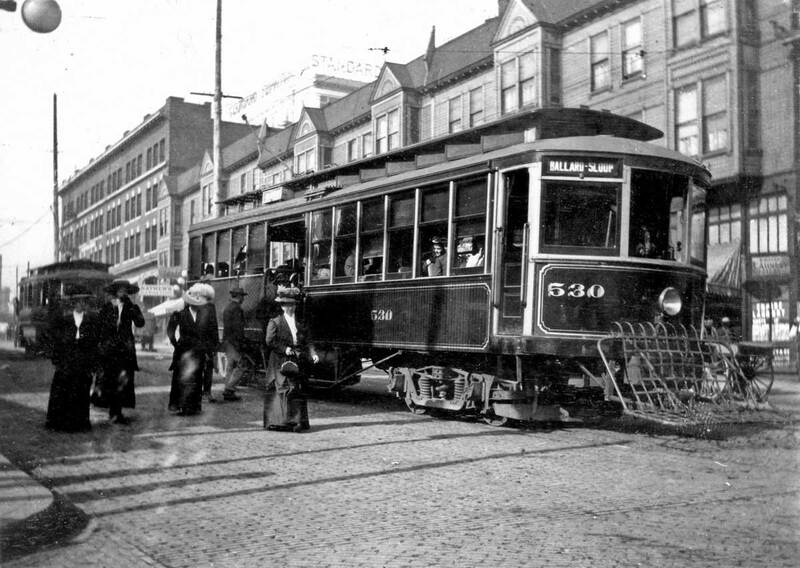 First Avenue between Pine and Pike streets was a principal early-century trolley-turning stage for lines to Madison Park, Capitol Hill, Queen Anne and Ballard. Add to the crush of streetcars the crowds at the Pike Place Market and bumper-to-bumper motorcars and you have a World War I-era urban mess that was exciting and even a bit dangerous. Reigning over this congested scene was the Liberty Theatre’s monumental electric silhouette. The Liberty Theatre was built in 1914 to surround a 1,500-pipe Wurlitzer organ. 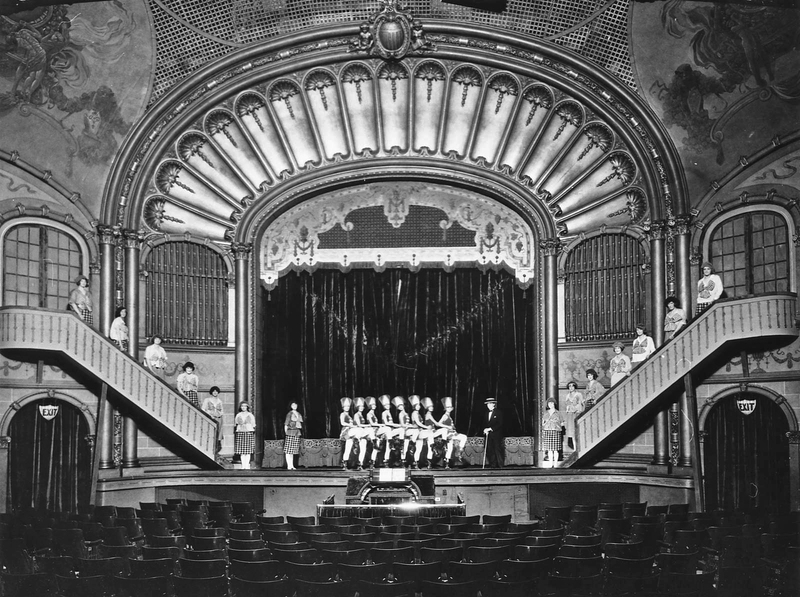 Everyone agreed the theater’s acoustics were first-rate, and Oliver Wallace, the theater’s first organist, had a variety of animal and industrial sounds he could lend to the silent films he accompanied. The Liberty’s Organ and for the moment an on stage act that requires no accompaniment. 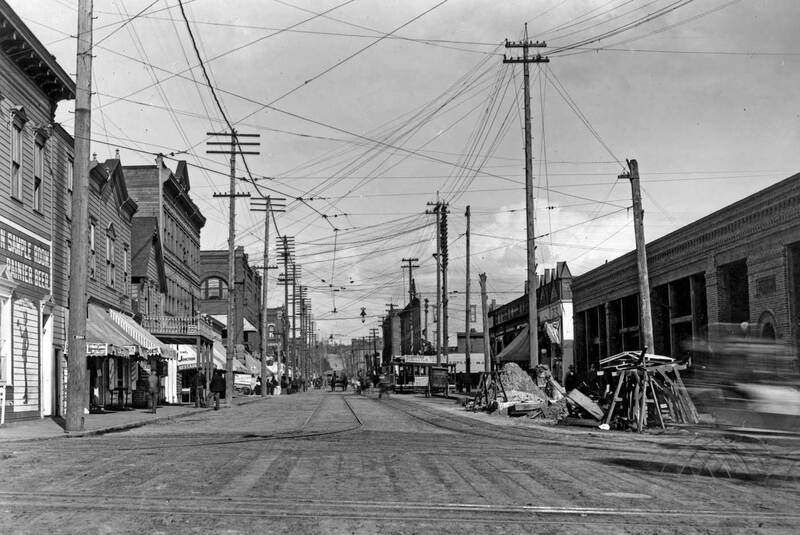 First Ave. north of Pike before the Liberty Theatre. The Liberty was a wildly successful operation. One of the first local theaters dedicated to films, it could entertain ten thousand customers in a day. Sometimes the lines of patrons backed-up to Second Avenue. 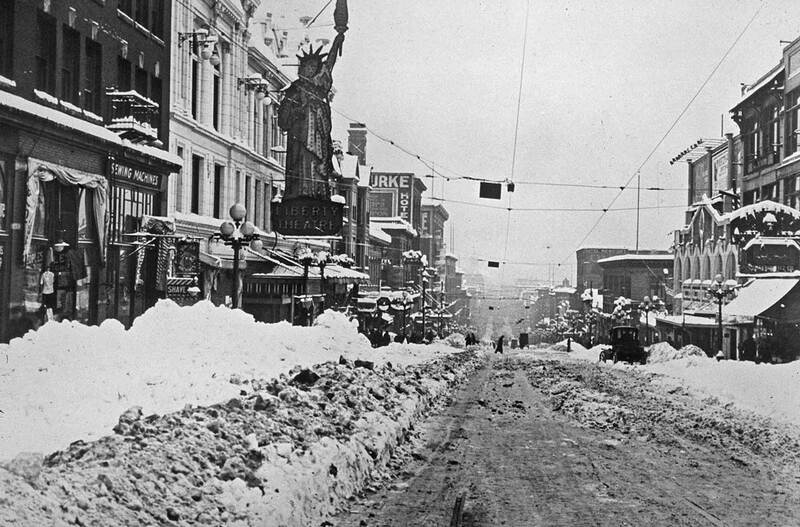 A nearly new Liberty Theatre holding its pose during the city’s “Big Snow of 1916.” The view looks south on First from Pine. 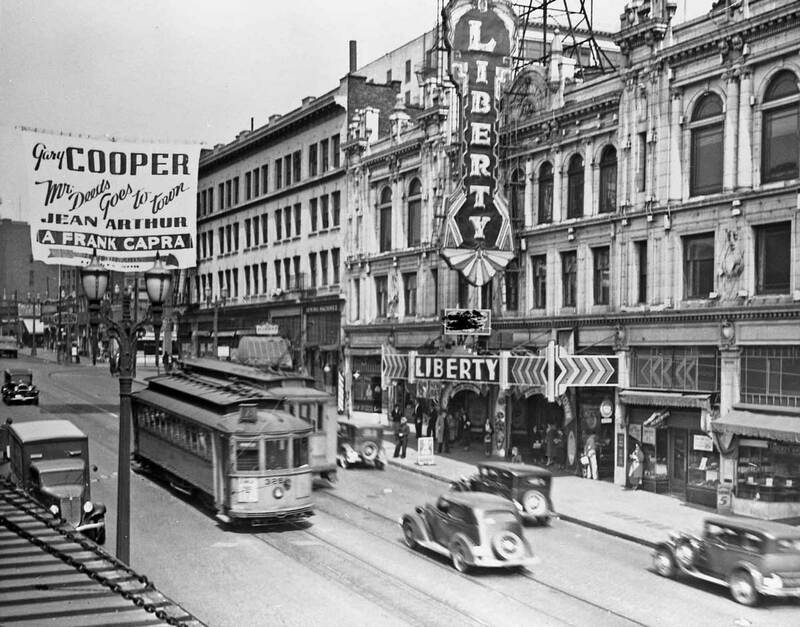 In 1939, the Liberty celebrated its 25th anniversary with a complete remodeling including a new neon sign. It reopened to the world premier of “Only Angels Have Wings.” The Liberty was sold in 1950 to the John Hamrick chain of theaters. In 1953 it got a screen and equipment for CinemaScope and stereophonic sound. But the conversion almost certainly wasn’t worth it. One year later the Liberty closed, and on June 24, 1955, its razing began. The site now is a parking lot. The Wurlitzer organ was saved. First carted off to the Pacific Lutheran College memorial gymnasium, it now is in a church in Spokane. A Frank Capra movie not to miss, Mr. Deeds Goes to Town, with Gary Cooper and the brilliant comedic ways of Jean Arthur. Mr. Deeds was released in 1936, and the Liberty was surely a first-run house. The hanging sign has change, but it is still not the lasts one. That one is up below. 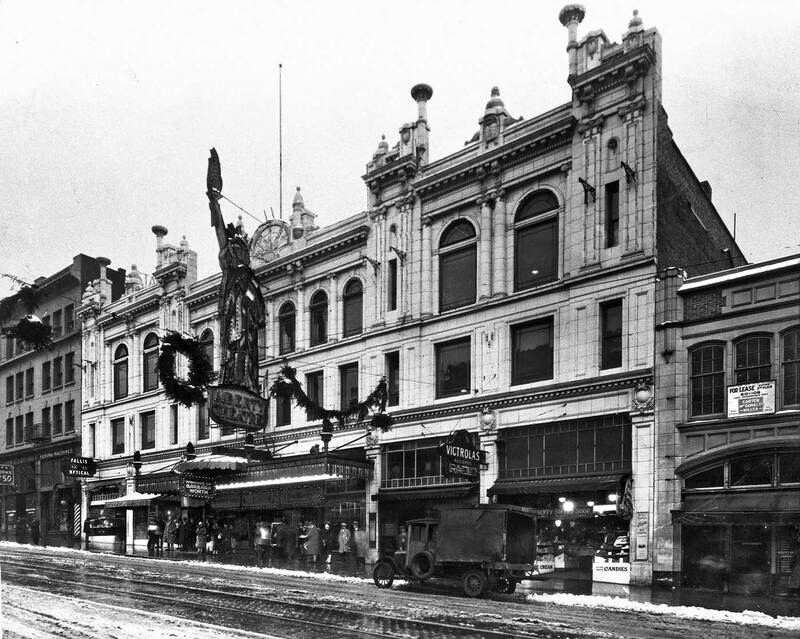 How many Times readers can still remember the ornamental Liberty Theatre on First Avenue across from the Market? On bright afternoons the light bounced off its terra-cotta façade illuminating the street. 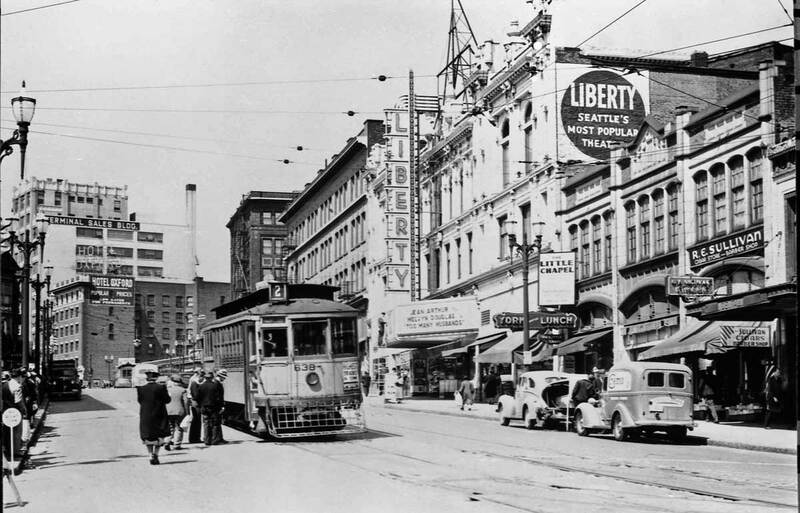 It is now fifty-one years since Theatres Incorporated sent a letter to Ralph Stacy, then the King County Assessor, that the company had “demolished and removed the Liberty Theatre and accordingly request that you remove the building from your assessment rolls.” Their intention to open a parking lot to “relieve the congestion around the Pike Place Market” was a sudden one. 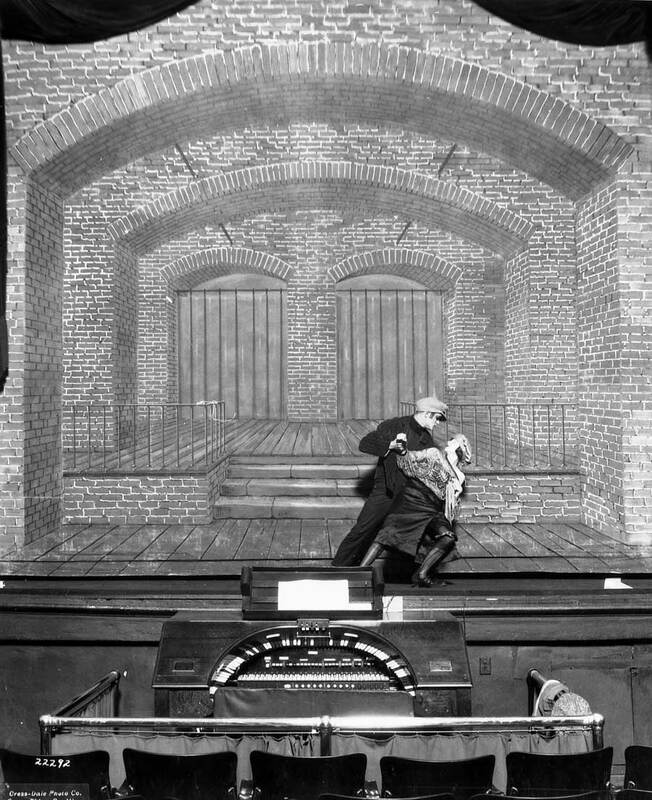 Only months earlier the theatre’s managers had briefly closed the Liberty for a CinemaScope and stereophonic fitting – but for naught. The Liberty first opened on Oct. 27, 1914, and it was built for movies. There were only two dressing rooms, and both were in the mezzanine. The theatre — with no pillars — was built around a 1500-pipe Wurlitzer organ that was famous in its time for special effects like birds cooing, crows cawing, and the surf pounding — an effect made within the organ by a rasping together of sandpaper blocks. The organist also kept ready in his pocket a pistol loaded with blanks for William S. Hart shoot-em-ups. The Organ’s largest part, a 32-foot bass pipe was removed when its soundings continued to knock plaster from the ceiling. Throughout its 41 years the Liberty was known for splendid acoustics. 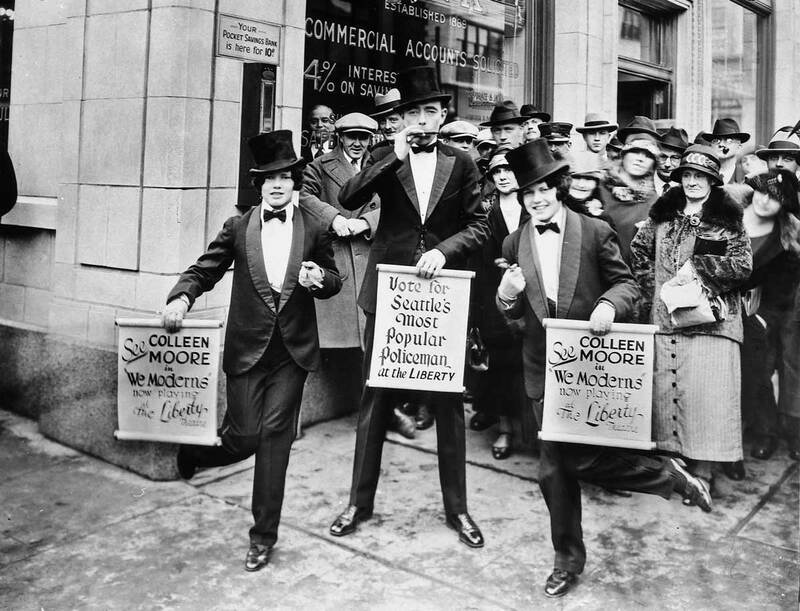 Ever competitive many Theatre’s promotions often spilled into the streets of the central business district. In “Household Magazine’s” review of “The Winning of Barbara Worth,” the 1926 silent film showing here at the Liberty, Gary Cooper is described as “the handsome young chap who stole the picture from Ronald Colman.” And that’s something. The movie was a hit and still being reviewed when the Liberty closed in December for new management and a new name. When it opened again on Jan 7, 1927 as the United Artists Theatre, Seattle Mayor Bertha Landes did the opening-honors standing beside a battery of U.S. Navy searchlights operated by uniformed sailors. They were recruiters, it was explained. Appropriately, the Wallace Beary vehicle “We’re in the Navy Now” was the film shown. Two years and some bad debts later the theatre was again the Liberty and stayed so until replaced by the parking lot in 1955. 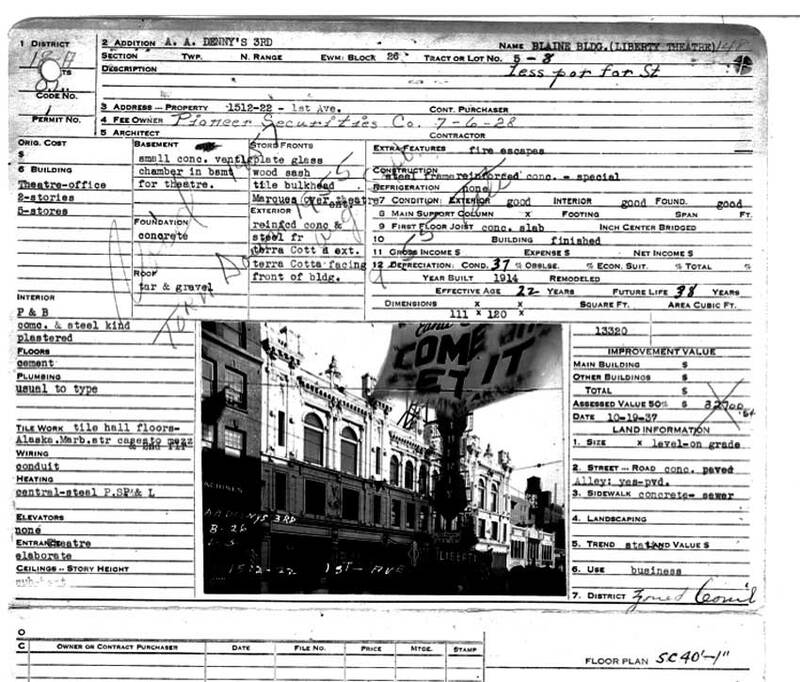 The Liberty Theatre’s tax assessment card revealing some of its appointments. 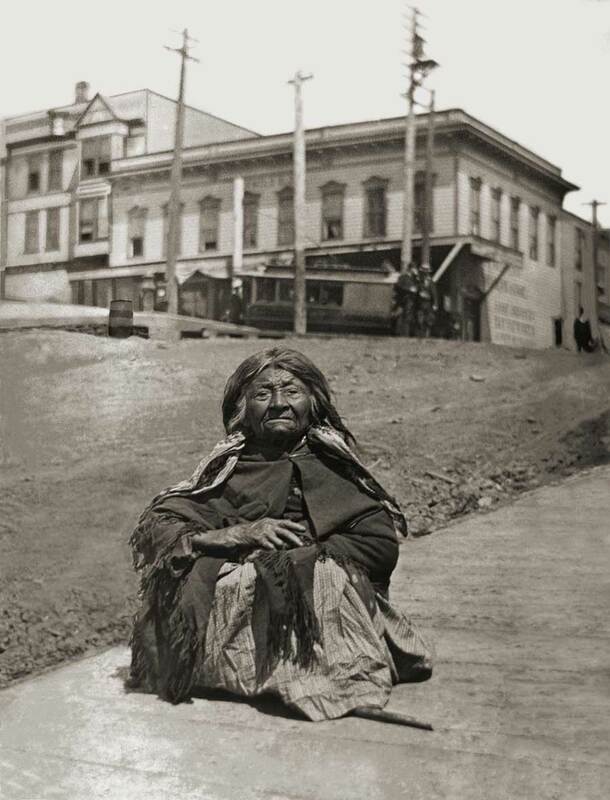 Popularly named “Princess Angeline” Chief Seattle’s daughter rests on the boardwalk descending on the south side of Pike Street west of First Avenue in the early 1890s and years before there was any Pike Place. 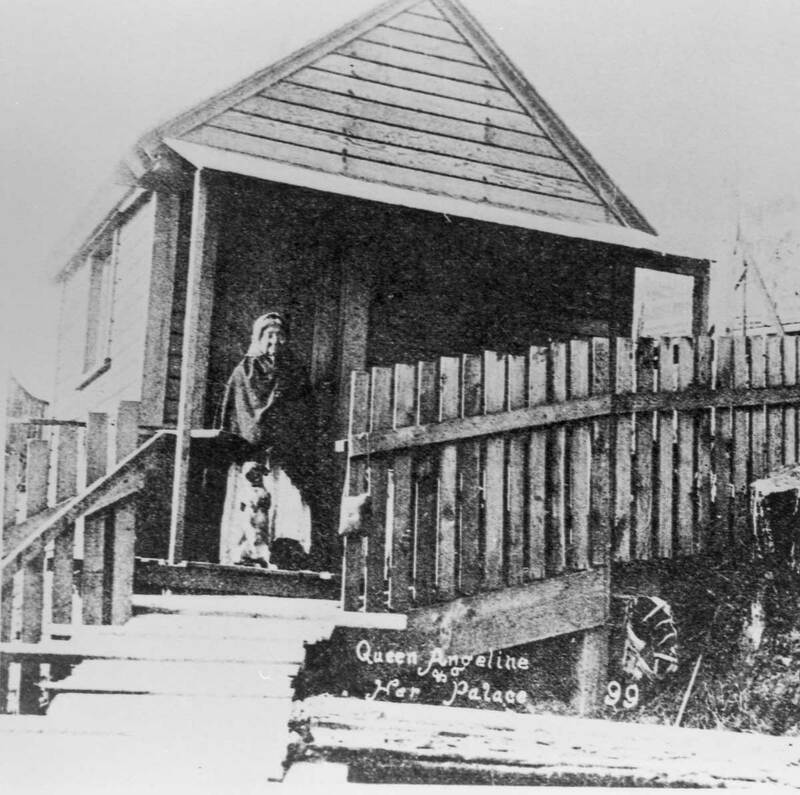 Angeline’s home near the waterfront foot of Pike Street. 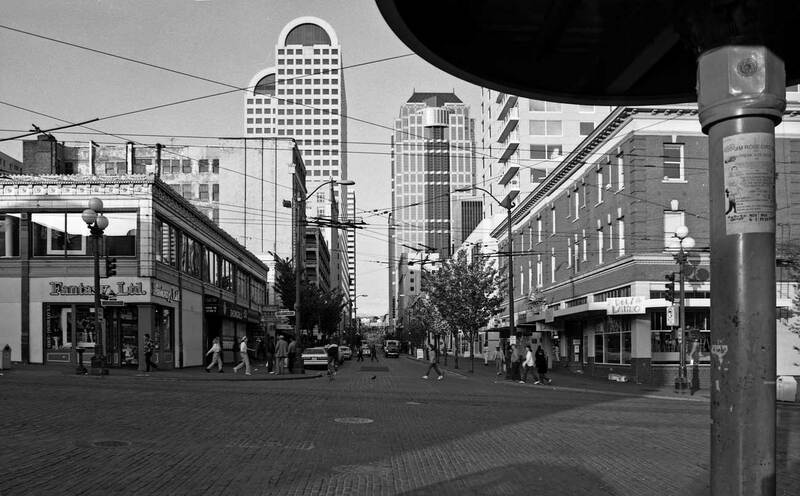 The two levels of Pike west of First – Pike Place on the left and the Post Alley on the right. 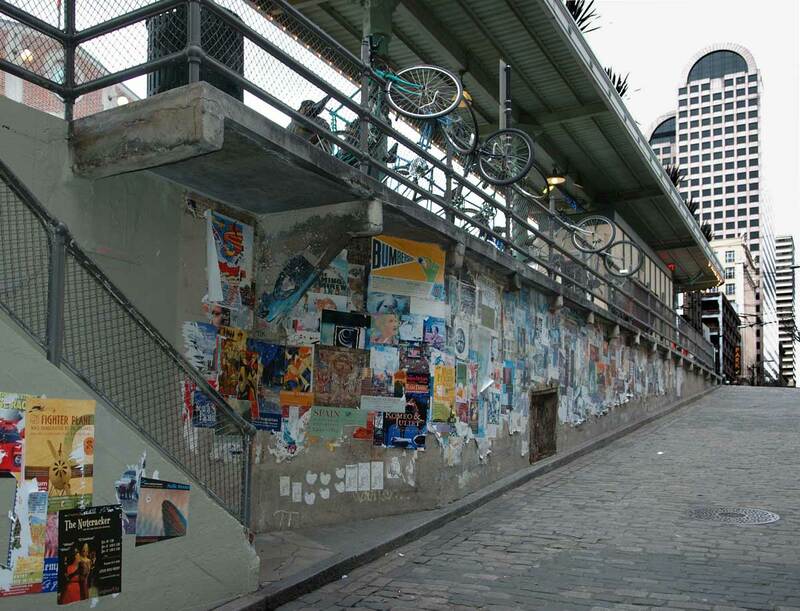 The north wall of the Post Alley is an ever building collage of posters and broadsides. 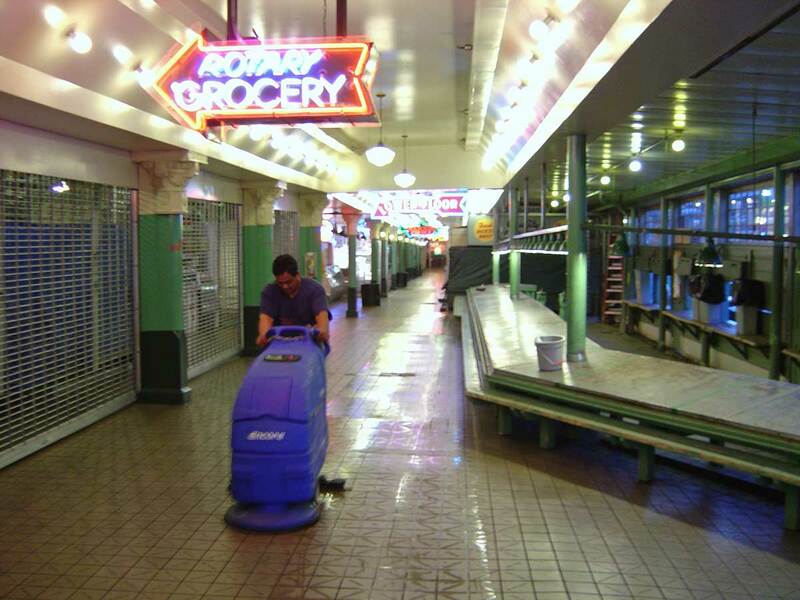 Before its brief nap between closing and the arrival of merchants in the morning, the Market’s donors tiles are dutifully polished. 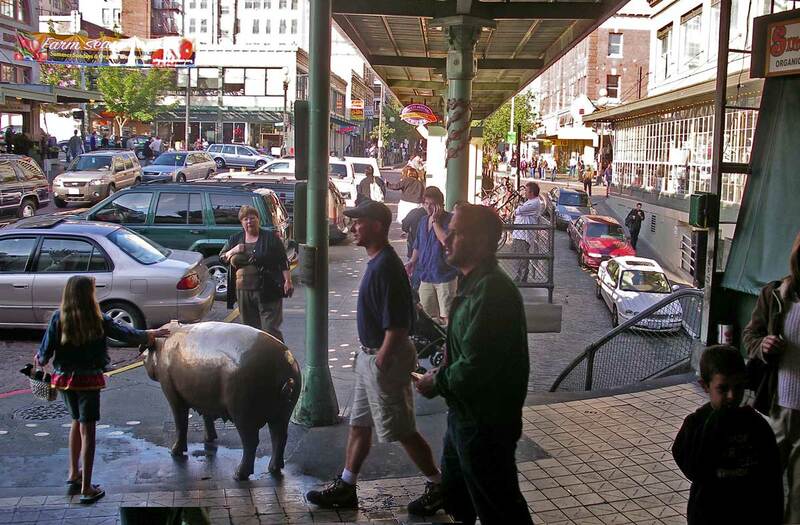 Previous PostSeattle Now & Then: Pachyderms in Pioneer SquareNext PostHELIX Vol. 4 No. 3 August 1, 1968, "Stall the Crowd with Visions of Johanna"